A beautiful tree of life tapestry by Gustav Klimt with his signature curved branches. Klimt (1862-1918) was an influential artist, an Austrian Symbolist painter and one of the inspirations of the Vienna Secession movement. His art is evocative and distinctive in that it shows a style all his own that defies the style that has gone before him and even those after him. His iconic use of curved branches in curls is seen here in his tree of life. In the forest floor we see his other iconic hallmark, the use of interposition of shapes, colors and even objects onto a surface layer, to provide a wallpaper like rendition of the forest floor. A richly colored piece in golds, browns and reds, to provide an wonderful warm scene to illustrate the immortal tree of life, which represents eternal life and the beautiful forces of nature which provides ever renewing life force. The tree's branches spiral upward towards the heavens, while its roots reach deep into the earth to represent its connection between heaven and earth. The lush branches in between represents the trees abundant supply of life on earth, as seen here by red flowers and as shelter for Klimt's ever present owl. This tapestry contains an abundance of bright gold color in its fabric. 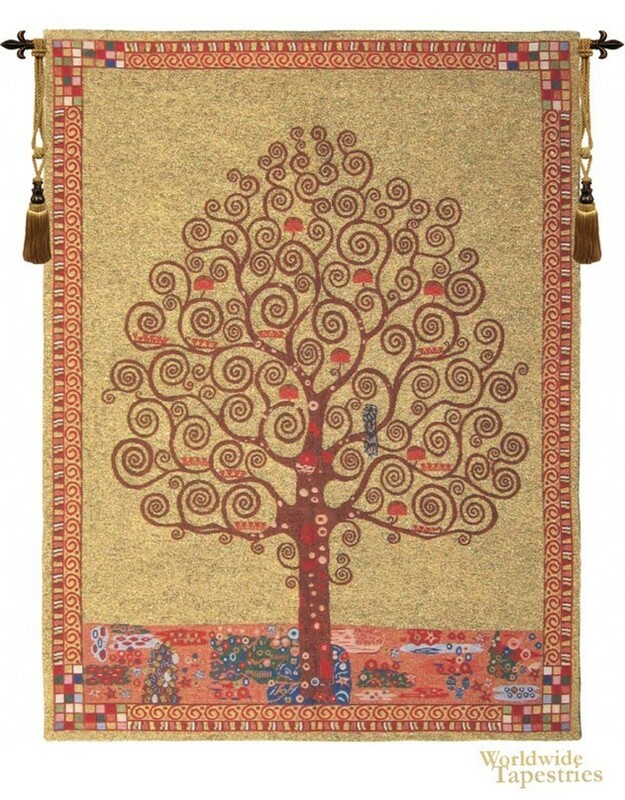 This tapestry "Tree Of Life - Klimt" is backed with lining and tunnel for easy hanging. Note: tapestry rod and tassels, where pictured, are purchased separately. Dimensions: W 23" x H 33"
Dimensions: W 33" x H 43"
Dimensions: W 49" x H 68"